I've been reading Nora Roberts books for a long time now. Whilst there are plenty of her books that I have really enjoyed, over the last few years there have been a number of her books, particularly the trilogies, where I felt like I had read them all before. Yes, the names have been changed, and the locations but there was a certain sameness that lead me to think that maybe, just maybe I was done with her books. At least the trilogies with a paranormal bent. I didn't necessarily feel that way about the standalone suspense titles, but I also haven't read any, mainly because I haven't been reading very much anyway. Recently, a few of my online friends began talking about this book and how it was different from other books by her. After one person said it was different I wasn't interested, but after hearing several people saying the same my interest began to be piqued. I was looking for a new audiobook and I wanted something different from the historical fiction and crime I had been listening to so I thought I would give this a go. So, was it different? It most certainly was, and yet there were also parts of the book where it was definitely a Nora Roberts book. The story basically unfolds as an epidemic called the Doom spreads around the world. It starts in Scotland but soon spreads all around the world as people travel and make contact with strangers who then make contact with others and and travel etc etc. Soon, law and order, government and communication collapses as millions of people die. For those who are immune, or who have special talents, survival becomes paramount, and it soon becomes survival of the fittest. There are entire sections in this book where it is full of the horror of a world falling to pieces and it was really well done. The fear that the characters feel as they try to get out of New York, running the gauntlet through humans who fear the uncanny - the faeries, the witches and warlocks, the elves - but also the uncanny who are on the dark side and who prey on humans. Really, these scenes are the strength of the novel. It is, however, this same uncanny element which had me thinking wait, this is definitely Nora writing here. For example, there are times when one of the main characters, Lana, lapses into trance and starts prophesying (for want of a better word) and that felt familiar and there were times when I wondered if maybe we weren't sure about what type of book it was meant to be. Is it meant to be a horror novel, or a paranormal fantasy, or a combination, or something different again. While I was reading (or should I say listening?) I did find myself looking for the tell tale NR signs. In a normal NR trilogy you have six people who come together and then pair off into romantic partnerships. There were times when I thought well here it comes, but in the end where ever this happened it was in effect off the page. Now I need to wait for the next book in the trilogy which is due out at the end of the year. I hope that the next two books are still in the same vein as this book. 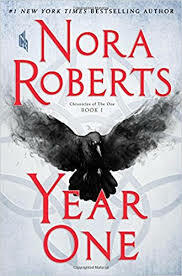 Undeniably Nora Roberts, but undeniably different, with the potential to be even more different if she could just step away from some of her normal cliches.